The X99 chipset has been launched to coincide and support the new Haswell Extreme (HSW-E) processors that you can read all about here. The chipset is newsworthy insofar as it supports DDR4 memory and ships with an updated southbridge featuring more SATA ports. There's not a whole lot else that's new, truth be told, but motherboard manufacturers remain keen to support it with a raft of boards. The reason for the interest in X99 stems from the length of time since the last high-end desktop refresh - X79 was launched almost three years' ago while X58 traces routes back to November 2008. First out of the X99 gate is Asus. Starting at around £200, four boards are to be made available from today. The best of the non-enthusiast band is the X99-Deluxe, retailing at £275, and we have it in for review. 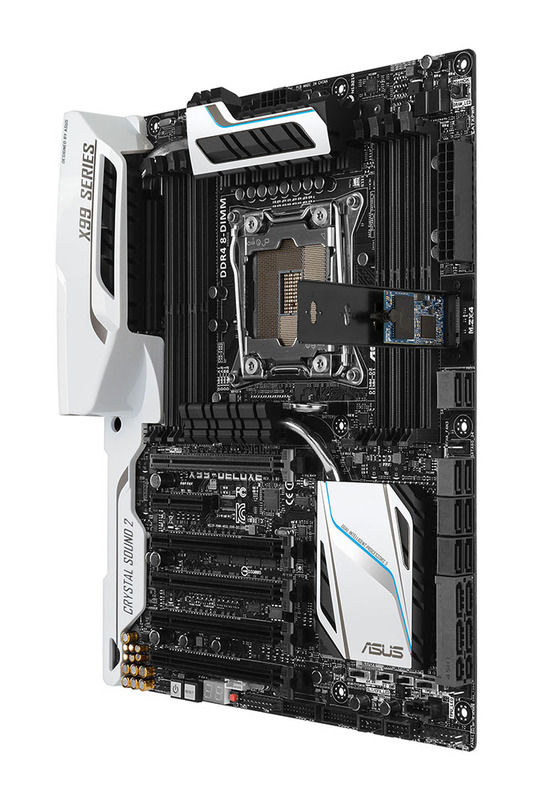 Asus has improved board aesthetics from one generation to the next. A large heatsink lines the entire left-hand side and covers a multitude of underlying chips, especially those contained around the power regulation components on the top-left. The white-on-black design draws tenuous parallels with the way in which Taylor Made has colour coordinated its range of golfing woods in recent years, so perhaps senior Asus engineers are golfing fans. But this isn't style over substance. 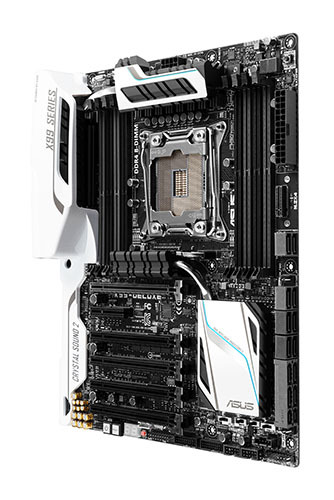 Asus connects both heatsinks via a heatpipe and provides the CPU with an 8-phase digital VRM design, ostensibly to help stability once the 140W CPUs are overvolted and overclocked. Sitting right behind the central heatsink is the traditional 8-pin CPU power cable, though we'd still prefer it to be located along the left-hand edge. The central LGA 2011-v3 socket is required to support the HSW-E processors. The same size as its X79 predecessor, meaning you can carry over older cooling, it is notched differently to stop users from inadvertently placing the wrong CPU in the socket. Yet Asus is doing something that, as far as we know, no other rival company is: it is using a custom LGA2011-v3 implementation known as 'OC Socket'. Two questions arise here. Why is it custom, and what difference does that make? Intel historically supplies motherboard manufacturers with detailed architecture/engineering guides that help when designing boards, which is important when accessing various voltage lines. Recent moves to fully-integrated voltage controllers has meant that such access has been curtailed, none more so than on X99, where motherboard partners are pretty much left in the dark. Intel prescribes a range of voltages and adjustments that can be made in the BIOS, mobo guys follow suit. Asus, however, believes the enthusiast should have unfettered access to all manner of voltage. Engineers, it says, have examined the LGA 2011-v3 CPUs in excruciating detail and deduced the role played by each of the pins on the bottom; the new chips have different pin-outs than their predecessors. The end result is that, fully tapping into this new pin-out, Asus' OC Socket has more pins than a standard LGA2011-v3. The extra pin-outs, located at six sections around the socket, enable all Asus X99 boards to circumvent the voltage limits imposed by Intel and provides a means by which more voltage rails can be monitored. What's more, the company says, enhanced monitoring and regulation helps when really pushing the CPU to the limit (think 1.6V-plus), minimising voltage drops and increasing overall efficiency by only allocating the exact voltage required. Intel's integrated voltages, accessed by other boards, aren't that fine-tuned, apparently. These pin-outs also control access to behind-the-scenes voltage and regulation of DDR4 memory. 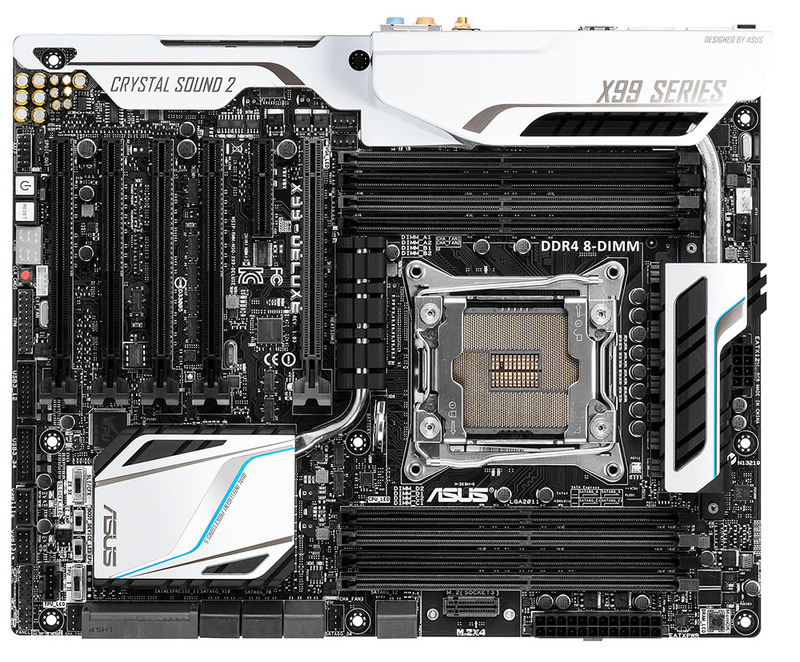 Asus goes further and says that its OC Socket, therefore, also enables X99 boards' BIOS to reduce memory voltage yet still increase DDR4 overclocking potential to levels higher than would otherwise be the case. Back to the board, the	space vacated by the 8-pin CPU block's relocation enables Asus to put two four-pin fan headers in its place. Eight DIMMs are just what we'd expect on the highest-end X99 board, and these can run at over 3,000MHz with suitable memory and tweaking in place. 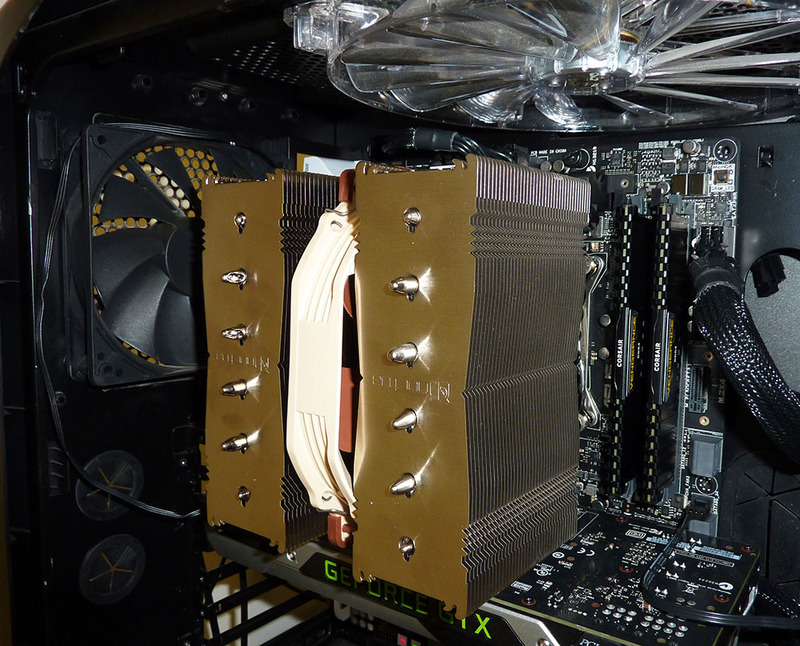 Everything seems closely bunched together but there's plenty of room to mount memory and a large cooler - we had no problems with installing the award-winning Noctua NH-D15 (click here for a pic). The massive LGA 2011-v3 socket does cause a few PCB limitations, however, especially when cramming every possible feature on the board. Take a close look at the interface between the 24-pin ATX and right-hand SATA. This is a vertically-mounted M.2 socket into which, with a supplied holder, you can insert any M.2-based storage drive. And knowing that storage is likely to play a large part in the kinds of PCs this board will go into, Asus also bundles in a PCIe card outfitted with an M.2 adapter, but do be aware that going down these storage avenues reduces the number of PCIe lanes open to graphics. This represents a genuine consideration for the 28-lane Core i7-5820K. Remember the potential 10 SATA 6Gbps ports running of the heatpipe-connected, heatsink-clad southbridge? 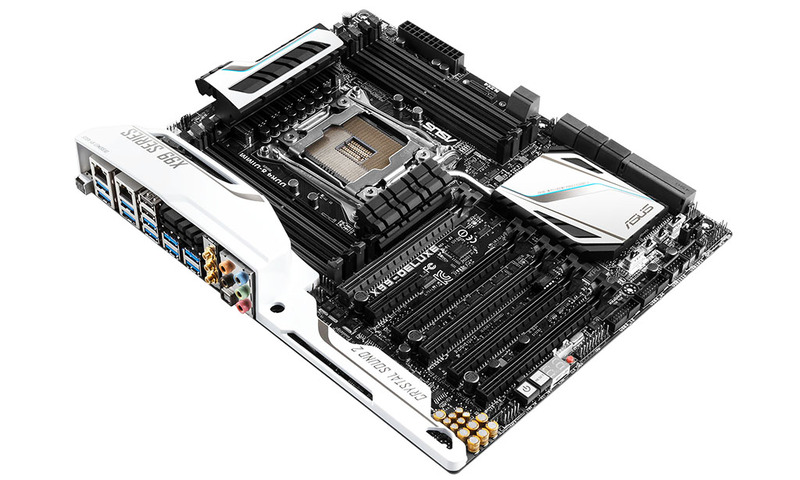 Asus indulges in a bit of mix-and-match here, keeping eight standard SATA ports intact. The remaining two can be used in two ways: as standard SATA 6Gbps or teamed to form SATA Express. Adding more, an ASMedia controller provides an additional SATA Express (or two SATA 6Gbps ports), as well. The way in which the SATA is plumbed out, taking due note of the presence of the vertical M.2 slot, the last four SATA 6Gbps ports (7 through 10) don't support Intel Rapid Storage Technology or RAID. Got all that? It's actually somewhat confusing to know just how many storage ports can be used concurrently and how they're arbited by the controller, but this is an Intel-led problem more than one of Asus' making. Sweeping down, past the switches that control the PCIe slot behaviour and TPU settings, Asus' next item of note is the Realtek ALC1150 audio codec featuring Crystal Sound 2. Found on select Z97 boards, this catchy name describes the enhancements to the audio process, including shielding, dedicated audio PCB design for left/right channels, EMI protection, and 'best-in-class' capacitors and amplifying. Those who read the CPU article are likely to know that Intel provides a means by which five graphics cards can be connected to the two premier HSW-E CPUs featuring 40 PCIe lanes. Motherboard manufacturers need to invest in additional clock logic to use the fifth slot, as Asus has done here, so you are able to run a quintet graphics cards at PCIe 3.0 x8 speeds on the Core i7-5960X and Core i7-5930K CPUs, though, just for completeness, do know that the fifth slot shares bandwidth with x4 M.2 slot. Beefing up the six USB 3.0 ports from the chipset, ASMedia is once again tasked to provide an extra eight at the back. The downside is that, with the ASMedia controller riding off the chipset, bandwidth is shared between the aforementioned fifth PCIe slot and x4 M.2. Even a 40-lane CPU and eight-lane southbridge isn't enough to cater for all the storage potential. Asus' Deluxe boards generally go heavy on storage and wireless. The X99 version is no different in this regard, because it features a 3x3 802.11ac WiFi radio and Bluetooth 4.0, in addition to dual Intel Gigabit Ethernet (more PCIe lane usage!). Supplied with a compatible 3x3 aerial in the box and provision for Thunderbolt by way of an optional Thunderbolt card, there's really not a whole lot more Asus could have added this time around. Yet, as always, each generation of Deluxe board has a trick up its sleeve. We see six 4-pin fan-headers dotted around the board. There are also two 5-pin headers, with one for connecting a Thunderbolt card and the other for a fan-extension module that increases the total number of 4-pin headers to seven and thermal sensors to eight. Our opinion is that it's a bit overkill on a standard board and more suited to something like the Rampage, but Asus probably wants to overload the features department. There's a lot to take in here. Perhaps the simplest method of explaining what's new is to look at the improvements over the X79 version of the Deluxe. 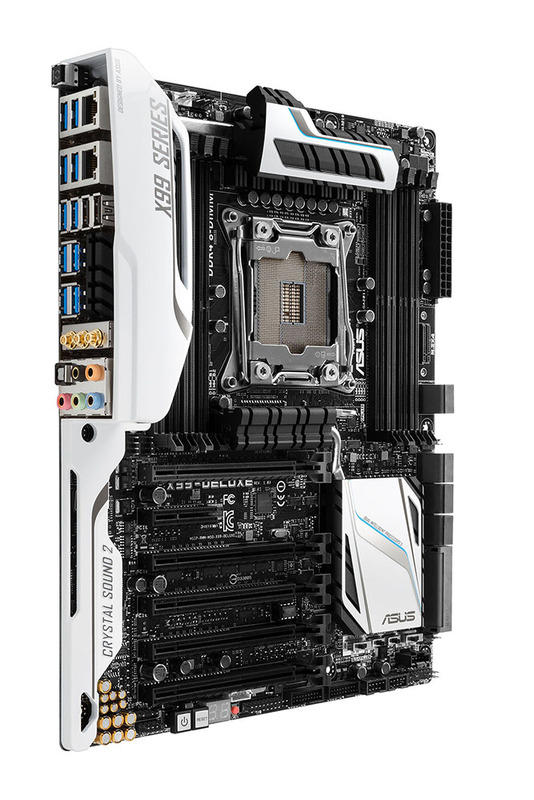 Asus now has 5-way optimisations (for easier overclocking), a custom socket with better voltage support, higher memory speeds, dual Intel Gigabit LAN, M.2 support, more fans, more SATA 6Gbps, more USB 3.0, SATA Express, better audio, and a better BIOS. Let's now trot over to that BIOS and peruse what else is new.